Brown chicken in a pan on 2 tbsp of oil. Season with salt and pepper. (For this step I used a Rotisserie Chicken) I shredded it and then tossed it with salt and pepper and cumin. Then I added some of our homemade taco seasoning. just a few sprinkles of it for more flavor. Prepare a bowl of water that you will dip your corn tortillas in (dipping them in water keeps them from getting dried out in the casserole) and the dish you will assemble the lasagna in. Put 1/2 cup of cream mix on the bottom of the baking dish and spread. Layer a row of tortillas followed with cream mix, chicken and cheese. You should be able to make 3 layers like this. Last layer doesn't need chicken, just a ton of cheese. We served ours with sour cream, fresh diced jalapenos, and taco sauce. Bake at 350 degrees about 30-40 minutes. I will be making this for sure. Cheesey oooey gooey one dish mexican dinners are right up Matt's alley! OMG this sounds amazing!!!! Must make this asap!!!! Cheese. Everywhere. I'm a fan. 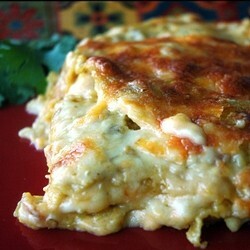 Mexican food + lasagna = perfect! Thanks for sharing, this is definitely going on my recipe list to make soon! Love this recipe! I'm always game for mexiroles! I'm so making this. Looks & sounds delish! This looks delish! One day so I am going to go through all these recipes and make them! When is the cook book coming out? That sounds amazing and something the whole family would love! I'm about to go on maternity leave so this sounds like a simple dish I can make and have leftovers for lunch! THANKS! oh my gosh. and who the hell discriminates against casseroles??!! no one worth knowing. pinning immediately!! Anything Mexican and covered in cheese is my favorite. Not that that's a good thing for my waistline! yum these w/ a margarita sound amazinggg! Whoa this is some serious downhome ooey-gooeyness here! This is the perfect marriage of my two favorite food groups...yes, I consider Italian and Mexican food legitimate food groups!